❶ Home / ❷ Travel agencies in Kenya / ❸ Tour Operators / ❹ Dallago Tours Kenya Tanzania Ltd. Send a travel request to Dallago Tours Kenya Tanzania Ltd.
Write/Modify a Review about Dallago Tours Kenya Tanzania Ltd.
What we do at Dallago Tours Kenya Tanzania Ltd. This is an African tours and safaris operator in Kenya, Tanzania, Uganda, Ethiopia, South Africa, including Zanzibar Island, Seychelles and Mahe Islands. In these countries, we are professionals on all kinds of safaris.Lodge Safaris, Short and long Safaris, Luxury safaris, safari excursions, beach holidays, honeymoon safaris, weddings safaris, camping safaris and mountain climbing. We offer the best safaris in Africa and work with professional well trained safari guides. We operate safaris in Kenya, Tanzania safaris, Uganda safaris, Uganda gorilla trekking safaris in Bwindi national park. Dallago Tours Kenya-Tanzania stands out as one of the most experienced and reliable tour operator in Kenya. With offices in Nairobi Kenya, Mombasa, Arusha Tanzania and affiliate offices in other African countries.. Every Dallago Tours Kenya-Tanzania safari vehicle is comfortable and well designed with a large pop-up roof for the best view and photography of wild animals. Our 4×4 vehicles and mini-bus have inbuilt fridges to cool your drinks while on safari. All Dallago Tours Kenya-Tanzania Safari guides have an average experience of ten years in game tracking and are knowledgeable about the people, flora and fauna of the country. The success of our safari will largely depend on the quality of our accommodation.We offer luxury (Lodge) Safaris where you are accommodated in carefully selected lodges/luxury camps and hotels which will make you feel very out of Africa yet very close to nature. And what else? We have what it takes to make your holiday a memorable one. Travel products/services provided by Dallago Tours Kenya Tanzania Ltd.
Company name Dallago Tours Kenya Tanzania Ltd.
Driving Directions From Nairobi Town, drive through Valley Road and alight at Hulingham center. Drive direct through Argwings Kodhek Road until you arrive at a center by the name Valley arcade. 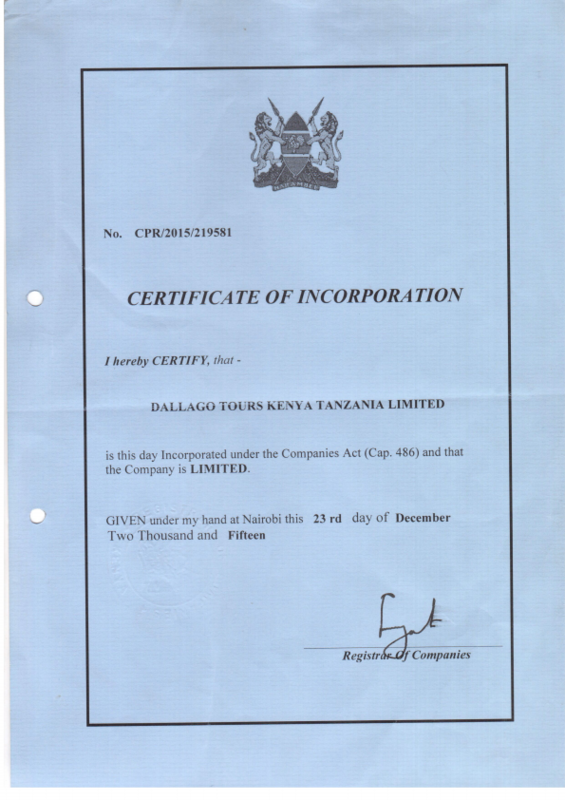 Personal Information for Dallago Tours Kenya Tanzania Ltd. Visitors Reviews for Dallago Tours Kenya Tanzania Ltd.